The original heroes of the hair metal scene of the 1980's, Kramer were a firm favourite with the shred players of the era including Eddie Van Halen. With their striking design and high output vibe, they really were the must have brand for fleet fingered virtuoso players. 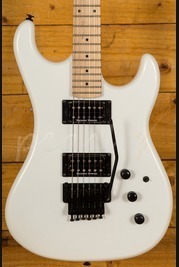 Kramer still embrace this design mentality and continue to produce great guitar built for speed and precision. Order your Kramer online today, if you'd prefer to try before you buy then head on down to our store based in Colchester and we will be happy to assist. Our team of experienced guitar enthusiasts are always on hand online and in store to answer any technical questions and to help you find the right product. Don't forget, if you order online and spend over £100 you'll enjoy free Next Day Delivery on orders placed before 3pm.